Hultafors axes are crafted by hand. It takes many blows with a hammer to produce the steels final shape. This method is costly, but it increases the density of the steel, thereby also improving the axe's durability compared to those produced with fewer blows. There are very few manufacturers left in the world with craftsmen who still command this traditional technique. 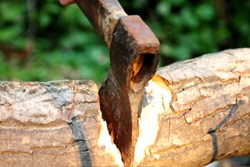 The hardening method used by Hultafors leaves a clear hardened zone where the axe can be resharpened without detracting from the strength of the edge. Used correctly, these axes can last for generations.